All of the details are in the following press release from Ducati, but keep one thing in mind. Even if you can afford one, the limited number of 500 units is almost sold out, as it was offered first to owners of the Desmosedici RR and R version Superbikes. Sorry. Fuel injection Mitsubishi electronic fuel injection system.Twin injectors per cylinder.Full ride-by-wire elliptical throttle bodies. Front suspension Öhlins FL916 43mm with TiN, fully adjustable usd fork. Rear suspension Fully adjustable Ohlins TTX36 unit with titanium spring.Adjustable linkage: Progressive/flat.Aluminum single-sided swingarm.4-point adjustable pivot. Additional equipment Full race, titanium exhaust system by Akrapovič, dedicated dust cover, front & rear paddock stands, machined mirror fill-caps, removal kits for registration plate holder, sidestand. Ken Wahl is always far better then Tom Cruise. I can’t afford the bike, but I would like a poster (large)of the Superleggera sans bodywork. With WSB rule changes in the pipeline (there’s a lower spec ‘EVO’ class next year, I believe, which will be the template for the 2015 championship), there’s a chance that this is at the very least a toe-in-the-water approach to ensure Ducati have an advantage in this production-based class. They were very competitive in this World Superstocks this year, and it was a crash that stopped them from probably winning the titile (BMW and Kawasaki are also competitive in this class, the others are nowhere). This harks back to previous periods of Ducati WSB dominance. It was always going to be that case that smaller factories would have to have increased prices, but Ducati’s approach of releasing 200-off specials (SPS models and suchlike) with, say, titanium valves and other highly priced features allowed for homologation and a useful benefit when racing. There was no way that even Honda would be able to produce a batch of their superbike with a few racing additions. So expect, after a seasons racing, a further-tweaked version of this bike to come along and that Ducati will be back at the front. This year’s WSB results were pretty embarrassing for them, especially if you recall the hype that went along with the Panigale’s launch. I’m not sure what is best for the championship. I think it’s been great that over the last few seasons, we’ve had every manufacturer at least on the podium. And although we shouldn’t overlook the David-v- Goliath of Ducati taking on the Japanese, when you have a 20% capacity advantage, and hyper-expensive bikes to base your racer on, the David and Goliath roles can seem reversed! The electronics packages of race teams have proven to be a leveller and allow Japan to get back to the front, even though the Italians pioneered the stuff on the track. There’s a pendulum issue here, and it always swings too far! We had the Japanese lobbying to allow 1000cc four cylinder bikes (all but killing the 750cc class), which was then superseded by a 1200cc twin cylinder allowance. We had a near boycott of the class by Japan a few years back. Where will it get to? There’s a feeling amongst WSB fans that Dorna will ultimately destroy WSB racing, and this might be a footnote in that destruction of the class as we know it. How does one website manage to attract so many negative, Monday morning industry professionals. I don’t even come here for the news anymore, I come just to read the absolutely ridiculous comments that the majority of the regulars to this site make. Here’s a tip, leave the industry to the real professionals and go ride your motorcycle. Assuming you actually own one of course. Personally, as an exercise, I think this is great. 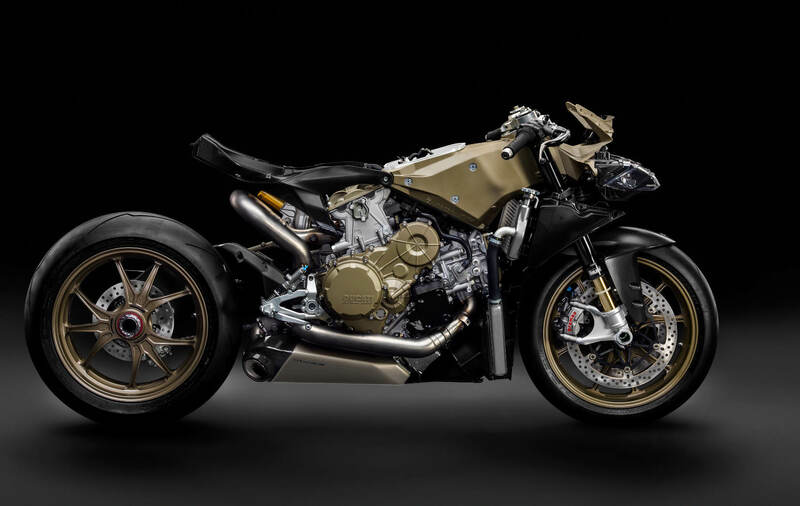 Since the economic crash sportbikes have been an afterthought for most companies and although I’ll never own this bike, or even get invited to own one, it’s nice to have something exciting to look at and read about for a change. I could care less about this type of “special edition”. It has always been irritating to me when the motorcycle press goes gaga over New Superbike X. A month later they are all gaga over Superbike X-R model. The next month it is Superbike X-RR model. Then Superbike X-SP with limited edition paint. Then comes superbike X-SPS with limitless electronic rubbish,special forks and a little commemorative plate rivited to the triple clamp. I’m confused. How much could you care less? A huge amount less? Does that mean you really want new superbike X as you presumably care a lot about it? Where can I buy this model X, as it sounds amazing? This made me laugh, because I wanted to correct the grammar of the original post. Instead, I will enjoy your humorous response. Well, they do have the CVO line. I think each of those models are “limited” to about 2000 per year, for each model. They always sell out. I’ll never buy it, but it sure looks pretty and probably sounds cool. Maybe I’ll see one on on I-5 just north of the Grapevine just like the Desmo I saw a few years ago. A cell phone flix is good enough for me to enjoy it and not potentially die. My R-1 has more than enough power than I truly need. I can’t fit on it (which is why I chose the 1198S) but I want it! But… I’d be too afraid to crash it to really ride it. I hope someone posts some fantastic videos. What a bike. you will. search for rnickeymouse on youtube. invariably one will be seen TRACTOR BEAMING itself into the guard rail on Mulholland. in much the same way we get baby formula from the Space Shuttle program, “the snake” is a real world application of DEATHSTAR technology. 5oo bikes will be made, and 2 years from now the 500 bikes will have a combined 3000 miles on them. these aren’t motorcycles with any purpose in reality at all. It’s just a museum peice, an ego stroke, or bike pron depending on how you look at it. This is a work of art and not a sociological/ class envy endeavor. There will always be those that can afford high end things like this and those that can’t. I can’t afford this bike nor would I buy it if I could due to a terrible dealer network. The nearest Ducati dealer to me is 150 miles away. I’ve had 2 Ducati’s and love the brand. Let’s see how it does on the track! This is Ducati showing us what we (the rank and file crowd) can get sort of close to doing with a base 899 or 1199 if so inclined. Won’t be the same uber exclusive bike at the end of the day but it will help sell Panigales nonetheless. Certainly makes me want a 899 more and will spur a lot of Corsa parts selling from their catalog. The great thing about a bike like this, aside from the company just making a statement about their engineering abilities is that it has features that will trickle down to affordable production machines at some point. If no one ever pushed the edge of the envelope in design we would’t get far. Typically, a bike like this will be sitting on the sales floor three years from now still for sale. I’ve seen it before, I’ll see it again. NOT with only 500 produced. And if you ever see it on the sales floor it will be because it personally belongs to the shop owner. If you are only just now deciding you might want one of these, then it is probably too late. I suspect every one of these will be spoken for within the next 8 weeks if they haven’t been sold already. This being a motorcycle is just co-incidence. To me this is primarily testimony of design and manufacturing capabilities from beginning of 3rd millennium. Look what human kind can do by sheer power of imagination and knowledge! +2, a man after my own heart. oh, if you get to one of his restaurants, he serves a great breakfast too. A beautiful machine that will seem cheap once Honda release the price on the 2014 RVF1000RR, Rumoured to be 80,000 Euro+! A true, in the flesh indictment of the Haves and Have Nots mentallity. Build a super exclusive motorcycle, then offer it only to those who are fortunate enough to already own a super exclusive motorcycle…and true the their nature, they buy ’em up. Nice stats…and a nice piece of mechanical artwork…but really, what’s the point? These bikes amount to little more than a $90,000 lump of painted metal that the owners can point at and demand the obligatory “Ooooh” and “Ahhh”. …and folks call cruiser riders posers? Class exclusivity on side, this is just a motorcycle on two wheels. Does any ‘cheaper’ version do less for you than this? Probably not. True have-nots will contend with riding bashed up scooters. Hmmm… Lose your job in the Obama revolution? For many, the ability to purchase this machine is not good fortune but hard work. Haves and have-nots have always been and always will be. Sell this crap somewhere else. As an engineering effort, styling exercise and business venture, I applaud Ducati and hope they sell every one they can make. No kidding what with 500 copies. And why the hell not sell it to your best customers, some of whom will race it? for the record, it isn’t. regs require they build 2,000. 4x as many. unfortunately, what you see above isn’t the cure for what ails anyway. No, I am gainfully employed, but thanks for caring nonetheless. Sorry you took it so personal (Sell this crap somewhere else? Really? ), but I think you missed my point. I have no problem with a person’s ability (ie: bank account) to buy the bike. By all means, if you’ve got the coin, spend it as you will. What I have a problem with is a company flaunting a press release that essentially says “Look what we’ve done…You can never own one”. Yes, it’s a tremendous piece of machinery…but like I said, what’s the point? I don’t mind that Ducati left me off invite list because I couldnt afford one anyway. And I won’t put down the guy or gal who can. Wish it had an enclosed chain, with carbon fiber shell and a 428 un-sealed chain it would be lighter and just as strong. I guess I’m going to be waiting a while for that super-exclusive MZ. Even if it had “an enclosed chain, with carbon fiber shell and a 428 un-sealed chain”…would you be buying one? It would make it more likely. That would be an advancemet in the state-of-the-art, unlike the current offering which is just a better made 1199. …and an 7.9 gallon fuel tank. Why is it that when one of these Ducati motorcycles are started and idling they sound like a bunch of nuts and bolts banging around in an empty 55 gallon steel drum? ’cause that’s actually not far from the truth. Lol Norm, have you been riding my son’s Monster? For that price it should come equipped an Italian engineer, shrugging his shoulders every time you fail to crack the top 10. Italian engineer, hell! It should come with an Italian babe! Sexist! The Italian engineer IS a babe! If your going to dream, dream big! If you buy it, babes will come. The price as shown from another source is……………. 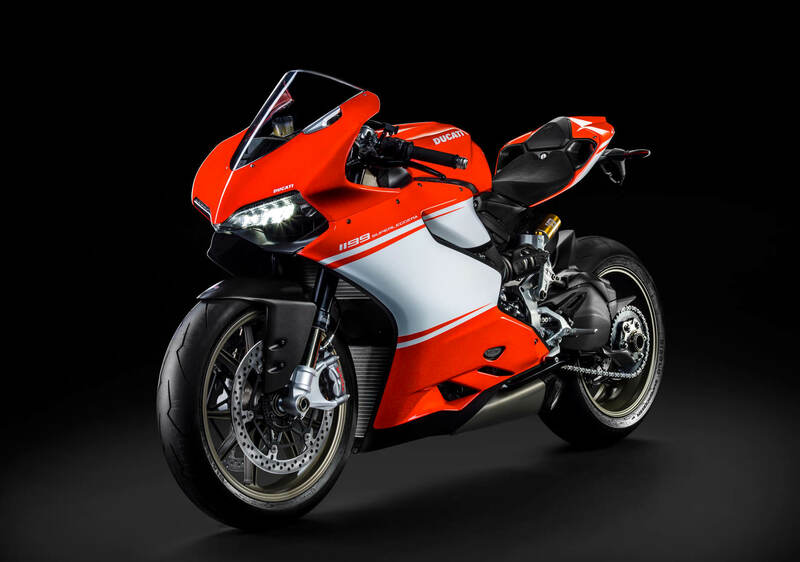 The 500 Ducati1199 Superleggera which will be manufactured come with a €66,000 ($90,900) price tag, which is close to the production versions of the MotoGP bikes. Huh? Next year you can get a production RCV213, but its in the millions as is the lease for the Yamaha engine. Suppose it is any use writing Santa this year?? Please!! Does it only come in red? Craigslist: Light cosmetic damage, take over payments, only $4700 a month for 15 years. Hey no complaining about it not coming with a centerstand…it doesn’t even come with a sidestand..thats an option. Bet its hard to fill up at the gas station! Do a motorcycle like this get insurance in the US? this design was never about driving dynamics as it was about the dynamics of manufacturing. The real answer depends on which alloys you are comparing, but the magnesium alloy being employed is almost certainly a bit stiffer than the aluminum alloy used for standard production. I don’t know if it is significant enough to affect the driving dynamics. Even if it were, I’d think the effects of the reduced weight would be much more noticeable. This statement assumes that the aluminum piece and the magnesium piece are made the same way/shape/volume. Decent engineering would dictate changes to the part to address differences in the material. Magnesium is the lightest structural metal currently available in the world. Its approximately 34% lighter by volume than aluminum and 50% lighter than titanium. Besides light-weight construction, a few of the other advantages that magnesium offers are: excellent fatigue resistance, denting and buckling resistance, and the highest known damping capacity of any structural metal. nope, pick your series. 2xxx to 7xxx. aluminum’s modulus is at a minimum 1.5x that any commercially useful Mg. I call BS on your representative. Well Norm, you would know. Magnesium is used to lower weight – not add strength. A bike overqualified for pretty much all non-WSB riders? I think we are just about there. Sorry Bob- thats dry weight- but still impressive! This thing holds 49 pounds of fluids? 341.7 lb.s with 90% fuel and all other liquids and 200+ H.P.